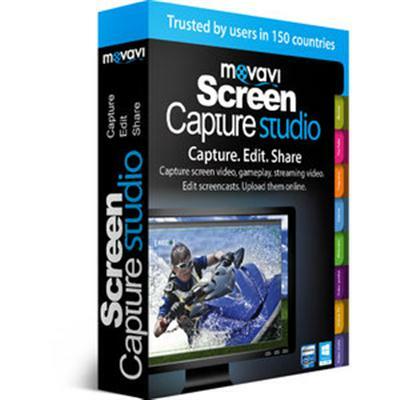 Movavi Video Screen Capture Studio is a software tool which helps individuals take snapshots, record the screen, edit videos and save them to the hard drive in an array of formats, such as AVI, MPEG, MP4, FLV, FLAC and MKV. Screen captures can be saved to the hard disk as BMP, GIF, JPG, and PNG files. After a typical installation, you are met with a simple interface, which can be used by any user, regardless of his or her previous experience with computers and without encountering issues. This application enables you to take snapshots and record a customizable area on the screen, as well as capture the audio stream. It is possible to add effects, such as mouse click sounds, and graphically highlight the cursor and clicks. Once you have finished recording, a window pops up, enabling you to preview your video, delete, convert, edit or share it online (YouTube, Facebook, Vimeo etc.). The editing window presents a wide range of tools and options. It enables you to cut, split and crop your movie, undo or redo actions, add text, tweak the volume and opacity levels, as well as import other media files along with it. You can also add effects and transitions from a huge built-in list, and control the playback speed. This utility enables you to burn DVDs with your projects, of chosen quality, aspect ratio, average and maximum bit rate. All in all, Movavi Video Screen Capture Studio is a complex piece of software, which can be very useful, specifically for teachers or individuals interested in creating tutorials. Response time is good, while CPU and memory usage is moderate.